A black and white wedding theme is popular among many couples, because it is simple and sophisticated. These two colors are timeless on its own and when combined together becomes ultra sleek and modern. They have a stark contrast, which is great if you want certain elements to visually pop. Weddings that rely on these two colors are typically more formal, it's definitely a black tie event. There is nothing casual about a black and white wedding. The great thing about having a black and white wedding theme is that it is not limited to a specific time period. You can make it feel vintage by adding elements of old Hollywood or make it feel contemporary by incorporating lots of three-dimensional shapes and figures. Whether you are going for glamorous or modern, these two colors can make it work. You can play around with the amount of colors used, it can either be a nice balance or both, mostly white with black accents or mostly black with white accents. If you want the entire event to carry out your black and white theme, it's important to get your guests involved too. You must make sure your wedding guests are well-informed that there is a dress code. Make the request prominent on your wedding invitations and have them confirm. Use invitations that are classically black and white to let them know exactly what kind of theme to expect. Wedding cakes are traditionally white, however adding the right amount of black gives it an entirely different feel. 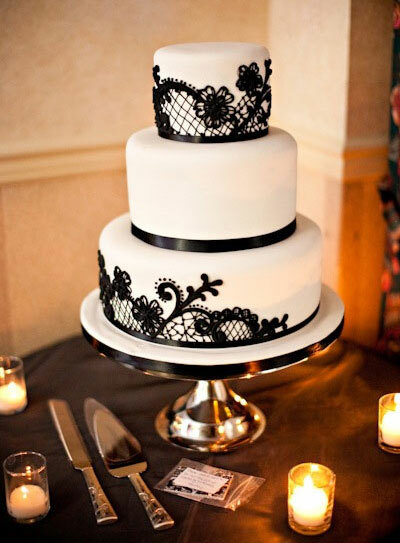 The contrast of black and white on a wedding cake really makes the cake itself stand out. Think black and white checkered designs or white with black swirls, it adds a bit of whimsy and fun to an otherwise boring cake. Using black as an accent to create an image on a completely white cake or the other way around is another great way of combining the two colors. In keeping with the black and white wedding theme, the bride should stick with the traditional white wedding gown. The bridesmaids can contrast the bride by wearing black dresses. Whether it's short or long, the bridesmaids will love having this option. Not only does it make them look slimmer, it's something universal that they can most likely wear again. The bride herself can add a black sash over her waist to not only suit the theme of her wedding, but also make her entire look more chic. Not a lot of thought goes into the men's attire since they will already be wearing black and white. There are many other little details that can be included into this theme. For instance the bridal bouquet, select an arrangement of pure white flowers and use a black ribbon to hold it all together. Black and white wedding favors are easy to find, let your wedding guests leave with something special to remember the day by. There are many wedding favor or party supply shops with exclusive black and white products that you can choose from.